Various hardware hacking ideas, generally related to microcontrollers (or other interesting electronic bits) and occasionally how one might use them in physics labs. Stefan and I cleaned out the garage last weekend. 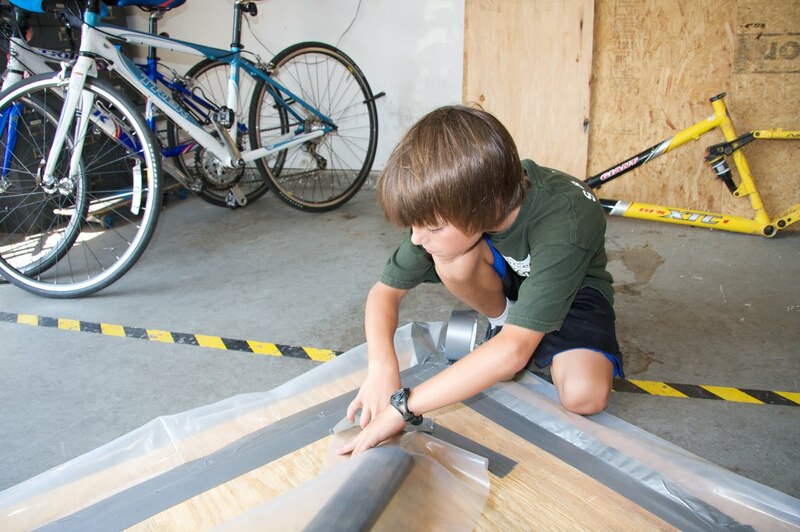 We found some useful scraps of plywood, and plastic sheeting, and a roll of duct tape, and a leafblower that nobody was using for blowing leaves. Rather than just throw them away, we decided to stick them together first and THEN throw them away. So we built a hovercraft. This is not the usual electronics-related hack; it has nothing to do with microcontrollers or teaching physics. But it was fun... and it's definitely a hack! Here's how to build your own. 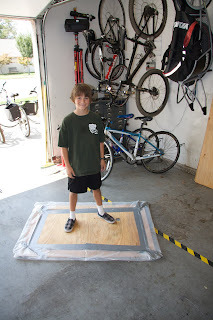 Start with a piece of plywood with an area of 7-9 square feet or so. Circular would probably work best, but anything roughly symmetric should be fine. Cut an off-center hole in it. 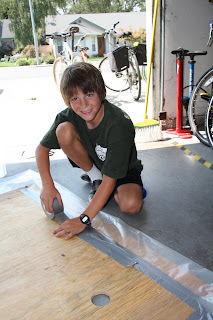 Cut a piece of plastic sheeting about 6" larger than the plywood. Put the plastic under the plywood and fold the plastic loosely up over the edges. 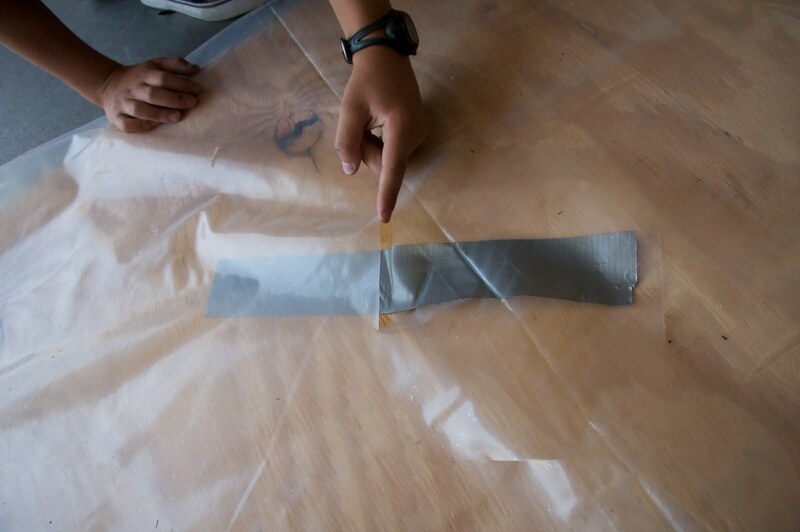 Tape the plastic down with duct tape. Staple through the tape every 1-2 inches, then put a second strip of tape over the staples to seal it. It should be evenly loose, not tight! We put the staples too far from the edge in these pictures, and had to put in a second row of staples closer to the edge. 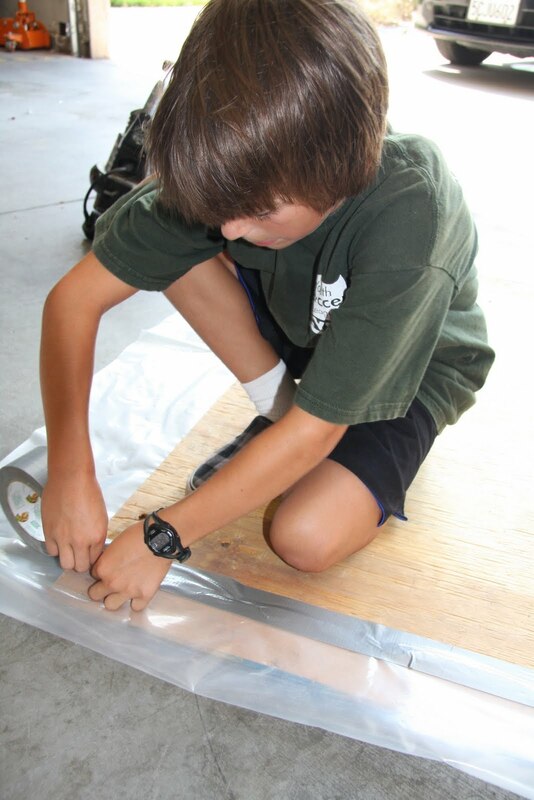 More duct tape! Make sure the plastic is completely sealed to the plywood, because when it comes off your hovercraft will stop hovering. Now turn it over and cut four (roughly) symmetric holes around an 8-inch circle in the center. We just cut slits a little more than 2 inches wide. 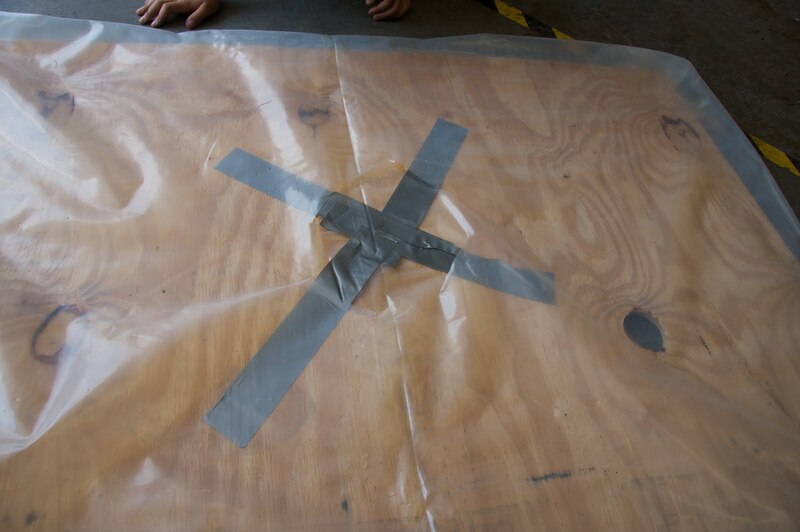 We then fed duct tape through the holes so that the center of the plastic was attached to the plywood. Anchor it firmly with more staples, and reinforce the plastic around the holes with —you guessed it— more duct tape. 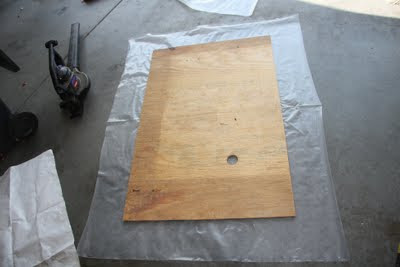 Air can now blow in the hole in the plywood from the top, inflate the plastic into a flattened donut shape, and exit through the holes in the center. 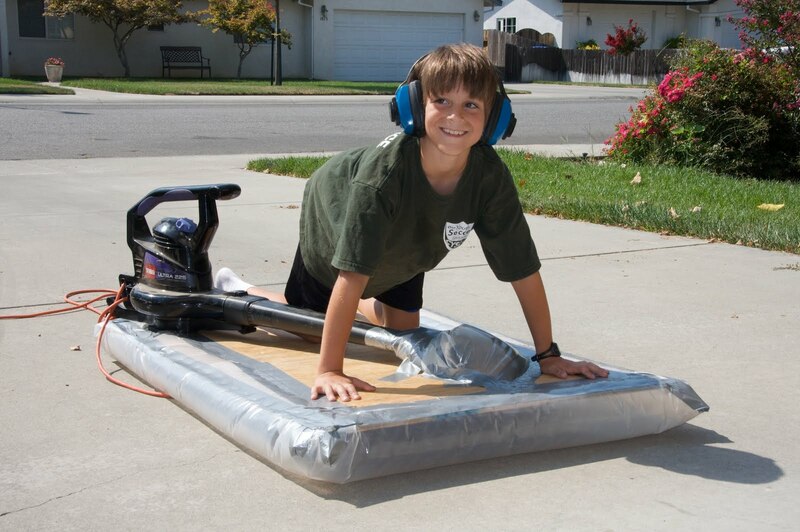 The filled plastic "bubble" makes a skirt for the hovercraft. 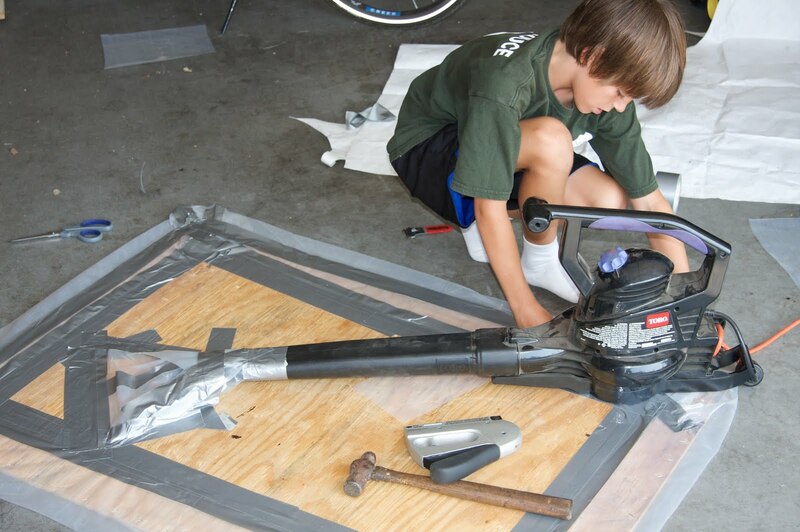 Next, turn it right-side up again and attach the leafblower. We used more plastic and duct tape and staples... Lots of staples... More duct tape... and eventually got something that would direct the air through the hole without too much leakage. Sit on top and turn the blower on — you're good to go! Obviously a gas-powered leafblower would be an improvement — this one is limited in range by the 50-foot extension cord. It's still fun for sliding around the driveway, though! I think that being a physics professor is the second-best job in the world. The best job in the world is "Daddy".